1. The Invigilators are instructed that on receipt of the Question Paper from the Chief Superintendent, he should check up whether the name of the subject, Paper Code, Medium etc., pertains to that day’s examination as per Time Table. The Invigilator will be solely held responsible for the issue of any type of wrong combination of Question Paper to the Students and he will be punished as per Act 25/1997 and also as per the C.C.A. Rules to negligence of their duty. 2. He should verify the identity of the Candidate with reference to the Photo on Hall Tickets and report to the Chief Superintendent if any impersonation is suspected or found. 3. The invigilator should check each digit of the roll numbers written by the Candidate with reference to the Hall Ticket of the Candidate concerned and any wrong noting of Roll Number is noticed, the same should be got ratified them and their itself with due attestation of the Invigilator. 4. The Invigilator should affix his signature along with the date of Examination on the front page of the Main Answer Sheet, Additional Answer Sheet, Graph Sheet, Map Point and Part-B Question Paper to avoid subsequent insertion of Additional Answer Sheets etc., in respect of 1 to 5 papers. 5. 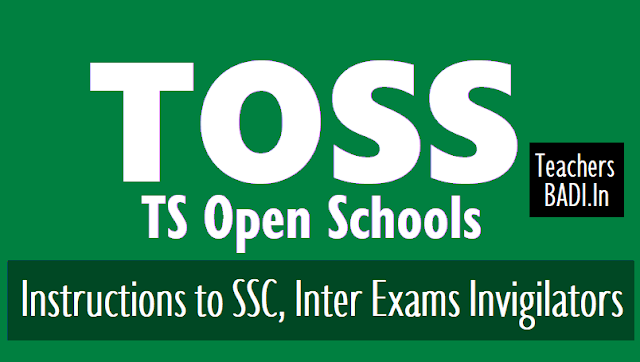 If his / her children or relation are appearing for the TOSS – INTER/SSC Annual Examination at the Centre in which he has been appointed, the same may be informed to the Chief Superintendent / Dy. Educational Officer concerned immediately to make alternative arrangements. 6. Invigilator drafted for the examination work should not be absent (except on Medical Grounds). Such Invigilator should produce the Medical Certificate issued by the Medical Board. All other things will be viewed as absconding and disobedience and immediate disciplinary action will be initiated against them as per the act 25/1997 and as per C.C.A. Rules.